Katherine Stevenson was 8 when she joined a UCSF study to test the effects of a video game on kids like her with sensory processing dysfunction, or SPD, a collection of symptoms where the brain has trouble filtering incoming information -- like sounds and instructions -- in organized, focused ways. Katherine is a happy, outgoing child with a high overall IQ, but her cognitive speed (relating to response and performance) is low in comparison to her critical thinking. Her main challenge is an auditory processing disorder that makes it hard for her to screen out certain sounds, because she hears them all at once. "It's almost like having a 500 horsepower engine that gets flooded," says her mom, Kori Stevenson. 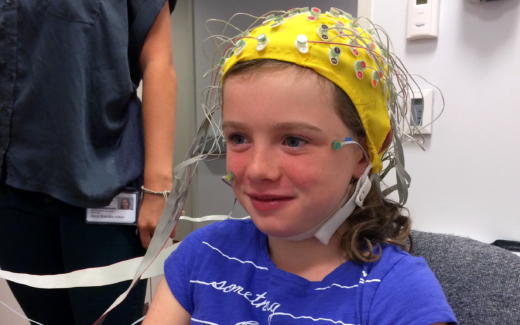 The UCSF study, spearheaded in 2014 by two Department of Neurology professors, brought Katherine and 62 other elementary school kids (38 with SPD and 25 with typical development patterns) into a lab where an EEG machine tracked their brain activity while they followed computer prompts designed to measure their ability to focus and multitask. Then the real work began. The kids brought home iPads loaded with a special software designed to target and improve problems with thinking, reacting, and performing tasks. Twice a day, five days a week for a month, the kids spent 30 minutes maneuvering a cartoonish 3-D figure along a moving pathway without hitting the walls -- tilting, swiping and jabbing the iPad as the game made all kinds of sounds and other potential distractions. "There were times that it was really hard to for her," says Stevenson. "There were some days when she breezed through and other days, she was in tears." But when the month was over, and the kids were retested, Katherine's performance had improved. "Her ability to focus was a little bit better. And she wasn’t as fatigued at the end of the day. Her ability to multitask improved," says Stevenson. Katherine's experience was not unique. The UCSF study, published Wednesday in the journal PLOS ONE, showed that while the iPad home training program benefited all the kids who participated to some extent, the results were even better for seven children (including Katherine), a subset of the 38 SPD children with symptoms of ADHD. This group dramatically overcame these issues, at least temporarily, after just a month of video play. Nine months later, those children had so improved (based on their parents' feedback) that they would no longer meet the clinical standard for symptoms of ADHD. Video games designed for kids with ADHD have received the most press. But for this study, UCSF Neurology professors Joaquin Anguera and Elyse Marco wanted to focus on an underserved group that doesn't get as much attention. Some brain training studies specifically target people with ADHD with gaming products -- a market ripe for profit, if it can be shown that such products really work. But Anguera and Marco wanted to work with children with sensory processing dysfunction, a group Marco got to know through her pediatric clinical practice at UCSF. If you're not familiar with SPD, you're not alone. The disorder is thought to affect 5 percent of all U.S. children, but it's a poorly studied group. Symptoms vary widely, from children like Katherine Stevenson with auditory processing issues to something closer to autism spectrum disorder and ADHD. As such, it is often misdiagnosed. The results of the UCSF study challenge the notion that prolonged exposure to video games, iPads and other interactive technology turns toddlers into strung-out youngsters with an ADHD-like inability to focus on tasks and get things done to completion. A preponderance of studies suggest that all that screen time does re-wire the brain. But that may not be a bad thing -- especially for kids like Katherine, who can benefit from learning how to focus on a single goal-based task and block out any other distractions. "The fact that these parents reported persistent amounts of improvement for nine months – I think that’s really remarkable," says Anguera, lead author of the study. The results showed some parallels to his much-publicized 2013 study where a different 3-D video game called Neuroracer trained seniors to multitask better than a group of 20-year-olds. Since the new study only included 63 kids, it was meant as more of a proof of concept experiment than a study meant to offer clinical conclusions. Cognitive scientists bristle at suggestions that any of the newfangled cognitive training programs on the market can work for everyone. Cogmed and Lumosity, for example, target both children and adults with claims of improving attention and processing speed. The most common word experts use to describe them is "exaggerated." Dr. Laura Carstensen, founding director of the Stanford Center on Longevity, is one of the skeptics. “Can you improve your brain so that it’s faster, more adept, more vital?," she told KQED in 2010. "That’s what the claims are, and I don’t think there’s really any evidence for that." In 2014, 73 experts signed an open letter (since taken offline) warning about companies exploiting consumers with such claims. Anguera is the first to agree. "You have all these problematic 'brain training' things, and it's fraught with snake oil," he says. "There haven’t been very many studies that have shown any kind of difference, that it does work." The main takeaway from this study, according to Anguera, is how well it demonstrates the need for personalized assessment before offering kids the brain-training programs of tomorrow. One size does not fit all; look at the fact that only a small subset of the study participants with SPD -- the cohort of SPD kids with hyperactivity or attention struggles -- showed long-term benefit from the video game training. "It really gives us a perspective. If you’re going to use these types of technologies to improve people's attention, you need to be putting thought into it. Not everyone needs the same type of intervention, and the same types of intervention won't work for everyone." That said, Anguera has confidence that the improvements his team observed were genuine, based on the fact that they were assessed with three different metrics: behavioral testing in the lab, parent surveys, and the use of EEG devices to measure brain waves. Anguera's team was particularly intrigued to watch a part of the pre-frontal lobe "light up" during EEG scans. It's the part of the brain that drives goal-directed activities, and researchers saw how much more responsive it became after kids had spent a month playing with the iPad. Scientists suspect that in kids with ADHD-like symptoms, the cognitive circuits at the front of the brain are not firing at the right time or they’re not firing enough, according to Anguera. Researchers don't know exactly how, but it appears that "pushing" on, or repeatedly using, these circuits of attention strengthens them, like bicep training at the gym. "There’s very few of these cognitive training studies – maybe none – that show a signature that correlates with behavior on some test of attention and shows what’s happening," says Anguera. "That's what makes this unique." 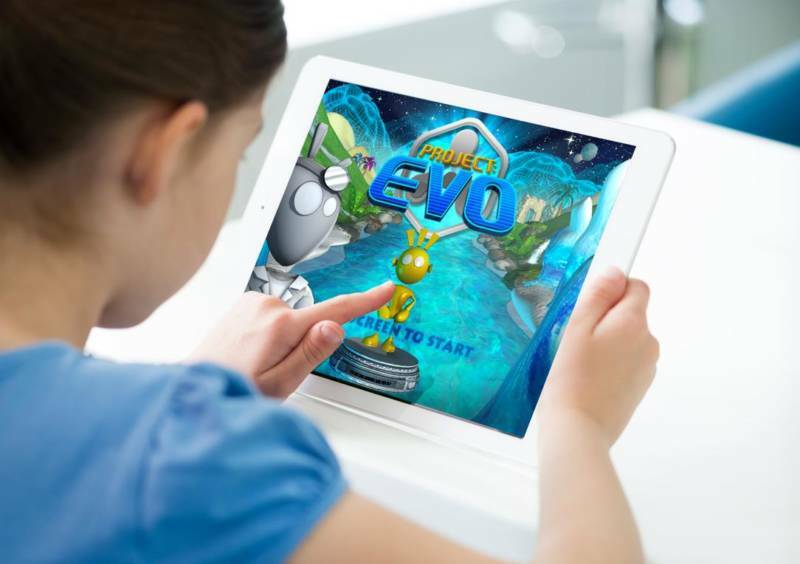 The UCSF study used an iPad game called Project: EVO. In 2015, Akili Interactive Labs, the software developer, used it to measure the effects on a small group of children with ADHD and a control group. The study found that, after playing the game five days a week for a month, the children with ADHD showed significant improvement and the control group did not. Akili Interactive is now testing their software on hundreds of ADHD children at 13 study sites across the U.S. and aims to be first FDA-approved ADHD videogame doctors prescribe to parents.